Baking powder is a solid mixture that is used as a chemical leavening agent in baked goods. It can be composed of a number of materials, but usually contains baking soda (sodium bicarbonate, NaHCO3), cream of tartar (potassium bitartrate, C4H5KO6), and cornstarch. (A base, an acid, and a filler respectively.) Baking powder is made by generating these solids, combining them in unique proportions, and then transferring them to packaging. First developed in the mid 1800s, baking powder formulations have changed little since. To modify the final characteristics of baked goods, leavening agents such as baking powder or yeast are added to recipes. A leavening agent is a material that releases carbon dioxide (CO2) under certain conditions. This creates gas bubbles in the dough making it expand. When the product is baked, air pockets are created resulting in food that is light and crispy. Baking powder is generally preferred to yeast because it produces bubbles much faster. Yeast leavened dough takes anywhere from two to three hours to rise. Baking powder dough takes about 15 minutes. Baking powder is a white solid that typically has three components, including an acid, a base, and a filler. When water is added to the baking powder, the dry base and acid dissolve into a solution. In this form, the compounds react to produce carbon dioxide bubbles, however, the amount of carbon dioxide produced by this reaction varies. Baking powder determines the final texture of the food and can affect the flavor, moisture, and overall palatability. The development of baking powders began with the discovery of carbonate materials. One of the first carbonates was potash (potassium carbonate, K2CO3), a material that was extracted from wood ashes. During the eighteenth century, potash production had become a major commercial industry. American colonies exported huge amounts to England where it was used by glass factories and soap manufacturers. Potash's usefulness to the baking industry was discovered during the 1760s. Prior to this time bakers had to hand knead dough for long periods to get the proper amount of air mixed throughout. For recipes which called for sourdough, pearlash (concentrated potash) was added to offset the sour taste. By chance, bakers found that these types of dough rose quickly. Evidently, the pearlash reacted with the natural acids in the sour-dough to produce carbon dioxide gas. This discovery revolutionized the baking industry. gas quicker and the aftertaste was not as bitter as soda ash. Another important development in America was the development of potassium bicarbonate (CHKO3) by Natha Read in 1788. He suspended lumps of pearlash over fermenting molasses. This converted the potassium carbonate into potassium bicarbonate. Unfortunately, this process resulted in a less dependable leavening agent when compared to that manufactured in Europe. In 1834, Dr. Austin Church developed a different process for making baking soda from soda ash. This product is still sold today under the Arm & Hammer name. During the 1860s, various companies introduced other ingredients in their baking soda formulas and sold them as baking powders. These ingredients behaved in a more controlled way in recipes. Over time, different carbonate and acid mixtures have been sold as baking powders. Today, sodium bicarbonate and tartaric acid mixtures remain the most popular. As suggested, the primary components of a baking powder are a dry acid, base, and filler. Each of these materials can have a significant impact on the texture and taste of the finished product. The most common dry base used in baking powders is baking soda, also called sodium bicarbonate. It is a water soluble white crystalline material, and produces carbon dioxide gas by itself when heated above 122°F (50°C). In addition to its use in baking, it is also used in the production of effervescent salts in medicine to prevent excess stomach acidity and in various types of fire extinguishers. The type of acid used in a baking powder formula is more varied. The first baking powders used cream of tartar, a powdered acid. It was quick reacting and had to be put in the oven quickly or the gas would be spent. This material was perfect for products like pancakes or muffins. Today, there are four major acids used in commercial baking powders including monocalcium phosphate (CaHO4P), sodium acid pyrophosphate (H2Na207P2) sodium aluminum phosphate (H304P), and sodium aluminum sulfate (NaAl08S2). Monocalcium phosphate is a fast reacting acid which produces a large amount of gas within three minutes of its addition to baking soda. This is about twice the speed of other acids. Sodium acid pyrophosphate is a slower reacting acid and is used in refrigerated biscuit dough recipes. Sodium aluminum phosphate and sodium aluminum sulfate are also slow reacting acids which generate gas when heated. While these compounds are used, most bakers prefer aluminum-free baking powders due to the unpleasant flavor the aluminum can cause in the baked good. The third major component of baking powders is an inert filler. The most common of these is cornstarch. The cornstarch has three purposes. First, it helps keep the product dry and easily flowing. Without it, containers of baking powder could bind up and form one large mass. Second, it keeps the acids and bases separated and prevents them from reacting during storage. Finally, it adds bulk to the powder to make it easier to measure and standardize. While a variety of baking powders are available, all of them meet basic standards and generate almost identical amounts of carbon dioxide. The basic difference between all types is the reaction time. There are two categories of baking powders: single acting and double acting. Single-acting baking powders immediately produce most of their gas when mixed with a liquid. They are classified by the type of acid they utilize. Those that contain cream of tartar and tartaric acid (C4H606) create gas rapidly when mixed with baking soda and a liquid. These batters must be cooked quickly or they will go flat. Slower single-acting baking powders are phosphate baking powders that contain either calcium phosphate (Ca3O8P2) or disodium pyrophosphate (H2Na2O7P2). Aluminum sulfate (AI2012S3) powders react more slowly at room temperature but give a bitter taste to the batter. Most commercial baking powders are double-acting. These means that initially a small amount of gas is released when it is mixed with a liquid. The primary generation of gas occurs when the batter is heated during cooking. These types of powders allow a batter to be left in an unbaked condition for long periods of time. Often double-acting baking powders have two acids, one which reacts immediately and one that reacts when heated. A less often used third type of baking powder is baker's ammonia. It results in a light, airy product but can impart an ammonia flavor if not used properly. It is best used in the production of flat cookies, helping to dissipate the ammonia odor during cooking. Baking powder is made in a batch process and involves production of the component raw materials, blending, and packaging. 1 The manufacture of baking powder begins with the production of sodium carbonate. Known as the Solvay ammonia process, it was first developed in 1861. 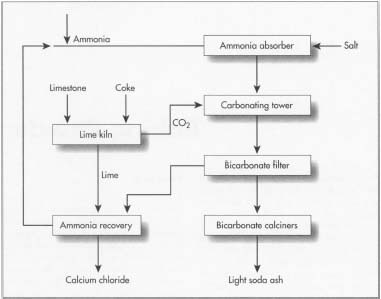 In this process ammonia and carbon dioxide are passed through a saltwater (NaClH2) solution in an absorption tower. This results in a compound called ammonium bicarbonate (CH5NO3) which reacts with the salt to produce crude sodium bicarbonate crystals and ammonium chloride (ClH4N). 2 The bicarbonate crystals are filtered out using vacuum filters or centrifuges. They are then washed with water to remove any residual chloride. The resulting solid is then conveyed to the calcining operation. Here, the material is heated and reacted with carbon dioxide to produce sodium carbonate, or soda ash. 3 The soda ash is dissolved, carbonated, and cooled which results in crystallized sodium bicarbonate. This solid bicarbonate material is of a purer concentrate than the intermediate bicarbonate formed earlier in the process. It is then laid out on driers to remove most of the moisture. The product is passed through metal screens to produce the desired particle size and filled into drums for storage. 4 The solid acid for many baking powders is tartaric acid. This material is made using potassium hydrogen tartrate, which is a waste product from wine making. The potassium hydrogen tartrate is first purified and converted to calcium tartrate. Using sulfuric acid, the calcium tartrate is hydrolyzed to produce calcium sulfate and tartaric acid. These materials are then separated and the resulting tartaric acid is purified and dried. 5 The sodium bicarbonate, tartaric acid, and cornstarch are transferred to a blending area. Compounders pour the appropriate amount of each solid into mixing containers. These mixers have large, stainless steel blades that thoroughly combine the powders into a single, homogeneous blend. This material is then transferred through vacuum tubing to the filling machine. 6 The baking powder is placed in a covered hopper and dispensed into the desired package. Baking powders are packaged in a variety of ways depending on the manufacturer. For home use it is typically sold in a 4 or 10 oz (113 or 264g) can. Restaurants can get baking powder in 5 or 10 lb (2.3 or 4.5 kg) metal cans. Industrial bakeries buy it in 50 or 100 lb (23 or 45 kg) fiber cartons. Filling is typically performed by a rapid, carousel filler which forces a specific amount of baking powder into the package which is then sealed. The sealed containers are placed into cardboard boxes and stacked on pallets. The pallets are transferred to trucks or railroad cars and shipped to local grocery stores or commercial bakeries. To ensure the quality of each batch of baking powder manufacturers monitor the product at each stage of production. The starting raw materials are subjected to various physical and chemical tests to determine if they meet previously determined specifications. Some of the characteristics that are tested include pH, appearance, and density. The finished product is also tested. Typically, the particle size is checked as are the micro-biological characteristics of the powder. While baking powders have changed little over the last 100 years, manufacturers are always looking for new ways to make a greater profit. The baking powders of the future may be blended with different ingredients to enhance flavor. They may also be specially formulated for specific types of batter to accentuate characteristics such as gas evolution speed, residual flavor, or blending ease. Certainly, in the future manufacturers will find less expensive production methods. Ciullo, Peter. Baking Soda Bonanza. New York: Harper Perennial, 1995. Kirk-Othmer. Encyclopedia of Chemical Technology. Vol. 1. New York: John Wiley & Sons, 1992. Macrae, R. et al. ed. Encyclopedia of Food Science, Food Technology and Nutrition. San Diego: Academic Press, 1993. "Is Your Baking Powder Still Potent?" Diabetes Forecast 50, no. 10 (October 1997). Lutzow, Susan. "Baking-powder Power." Journal Information Bakery Production and Marketing (November 1996). I would like to know if the (s.a.s)is a compound chemical?If so what is the components to acquire the s.a.s? Hi, I wish to know how many grams of pyrophosphate acid and sodium bicarbonate can be applied in 1kg of wheat flour to produce baking powder? I would like to know the best mixing ratio or percentage for making double action backing powder.